The construction industry is in for a shake-up that could spell the end for some smaller or less-prudent firms, Koh Brothers Group's chief executive officer Francis Koh predicts. Outfits which refuse to break from tradition or which lack the wherewithal to lean more heavily on machinery and prefabricated materials to become leaner with manpower are the most vulnerable, he adds. Koh Brothers, however, has been able to generate strong performances this year, thanks to its pursuit of the magic of synergy - past, present and future - and a passion for the job, he tells The Business Times. "Construction is in my blood," he declares. The challenge facing the industry is not one of lack of demand: the value of construction contracts is expected to be between $28 billion and $34 billion this year. The challenge is also not one of opportunities: infrastructure plans laid out by the government have made that clear. Rather, the seismic shift underway at the moment boils down to that dreaded P-word - productivity. Tighter manpower quotas, higher levies and a reduction in the number of employment passes issued have all colluded to drive up costs. At Koh Brothers alone, construction costs have gone up by 15 to 20 per cent. Tender prices have also risen, but they have not gone up quickly enough to cover costs, Mr Koh points out. "This is a transition period, during which some people (who) are not careful in terms of their tender prices may face financial difficulties." One advantage enjoyed by bigger players such as Koh Brothers lies in relative economies of scale. The company not only builds structures, but is also its own supplier through its building materials business; it has four precast plants here and in Malaysia. Mr Koh says: "I can do a real-estate project, I can do pre-fabrication and ask our precast (plant) to supply and ask our construction arm to do it." While acknowledging that government productivity grants do help, he says that smaller players will still fall behind because new equipment can be very capital-intensive. Asked if Koh Brothers would buy out firms that run into trouble, he replies that it may be easier to absorb their employees because each company has its own work culture. The pursuit of synergy has been a touch point for the company, which started in 1966 with initial renown in drainage construction. It has since spread its reach to three main businesses: construction and building materials, real estate, and leisure and hospitality. Mr Koh oversaw the setting-up of the property business and the leisure and hospitality business; he did this to diversify the group's earnings and to benefit from each group's expertise. The concept of synergy was also in force in the group's recent acquisition of water treatment company Metax, a Koh Brothers subcontractor. Despite a challenging year, net profit for the nine months ended Sept 30 was 14 per cent higher than a year ago, at $15 million, backed by higher revenues from all three businesses. The plan is to keep expanding on all fronts. All three divisions are financially independent, says Mr Koh, who does not rule out separate listings if they meet listing requirements. This year, he is zeroing in on growing the group's stable of hotels. It has actually pared debt in order to afford this expansion, and is casting an eye on freehold, completed projects abroad because of the high prices here. Koh Brothers owns the Oxford Hotel in Queen Street here. It has about 130 rooms and an average occupancy of more than 80 per cent. "Singapore is still healthy, but I think the upside may not be as great as for overseas properties," he says. In construction, the company will focus on higher-value contracts. "I think now the profit margins have to be slightly higher than last time; otherwise, the project may run into problems because of the productivity drive." 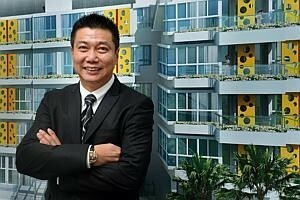 As for real estate, despite an uncertain outlook, Mr Koh remains confident that the market will grow, though in a "conservative" way. Through it all, Mr Koh sees himself as a conductor for the disparate parts of the orchestra of the business, with passion carrying him through. An avid traveller, he draws inspiration from his experience overseas for the design features of the company's real estate projects, and also relies on his daily observations and his personal interests. For example, the health-themed Parc Olympia off Upper Changi Road North stemmed in part from his interest in badminton. Other bold designs he has initiated include a rooftop observatory at the Starville condominium in Kembangan, and what he jokingly describes as "cheese"-like sun screens - yellow and with holes in them - at Fiorenza condominium off Upper Serangoon Road. "You see, for me, if I want to develop a project, (and I) don't have a theme, don't have a direction, I will feel uninterested. But if I have a theme, that's where the passion comes in." When it comes to construction, passion has to come from wanting "not only to see things happen, not only to plan for things to happen, but to make things happen", he adds. This passion for work extends to the company caring for its staff. Koh Brothers has set up a $500,000 "hardship fund" for employees facing financial trouble (excluding gambling problems); it also strives to keep older staff on the payroll as long as possible, though they may be redeployed to less-demanding jobs that tap their experience. "A lot of the older generation don't know how to retire," Mr Koh observes, drawing from anecdotal evidence of employees dying within a year of retiring. He is all for being transparent and keeping the lines of communication open with his staff. "We are not worried about problems. We are worried only that we don't discover the problem." For starters, he asks that employees address him by his first name. "You call me Mr Koh. Who? There are a lot of Mr Kohs (here)," he says, with a laugh.